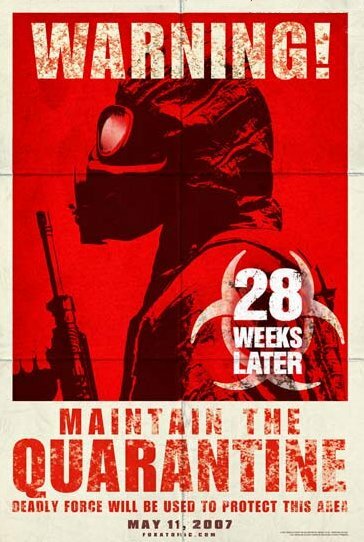 I never liked the idea of making 28 Weeks Later. 28 Days Later was a small independent film directed by the very talented Danny Boyle, who is probably better known for having directed Trainspotting. The film was different, smart and it felt like the work of someone who was exited to tell that story. And because of all that the film was very successful. The sequel, which is not directed by Boyle, feels like an attempt to squeeze some more money out of that success. The original film did not call for a sequel. And if they just wanted to make a zombie movie that could have easily done one without making it a sequel of sorts to Boyle’s original. All that said, I do love the poster. Sure, the guy in the anti-contamination suit is an iconic image and it is easy to use it in a poster in order to add some excitement and sense of dread. But what can I say? It works, and it is done very well here. The predominant use of red, the beaten down look of the poster, the big WARNING in the top. It all adds to a sense of a hell on earth, everything goes atmosphere. It makes the movie seem scary and exciting. And for the first time I’m thinking that maybe, just maybe, this is a movie I might want to see. And even if I don’t see the movie, I’ll probably want the poster.